GOT LEAKS? LOOSE OR DAMAGED GUTTERS AND DOWNSPOUTS? STAINS ON YOUR ROOF OR SIDING? Our Gutter Repair Team Has Just the Solution The seasons can wreak havoc on your gutters and downspouts. They can come loose or spring leaks. But a leak or loose parts doesn’t necessarily mean you need to replace them. Got Leaks? Loose or Damaged Gutters/Downspouts? The seasons can wreak havoc on your gutters and downspouts. They can come loose or spring leaks. But a leak or loose parts doesn’t necessarily mean you need to replace them. Maybe all you need is a re-sealing or a tune-up. For over 20 years, customers throughout Bergen, Rockland and Orange County New York have trusted us for all of their gutter needs – from installation and repair to cleaning and gutter guards. Also, if you have stains on your roof or siding, our roof cleaning and power washing services will make them look like new! 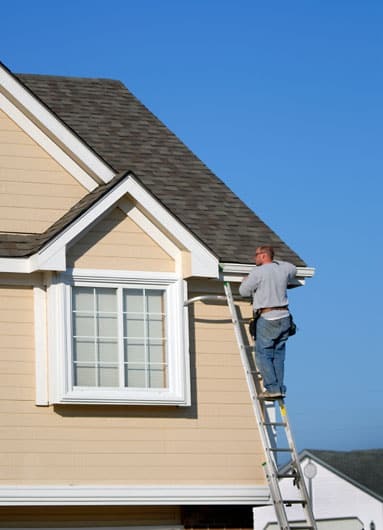 You’ll find our team repairing gutters all over Rockland, Bergen and Orange County NY. ...to learn more about our gutter installation, repair, and cleaning services.